Whales face many threats to their welfare, health, and their existence. The main cause is commercial hunting and pollution. Chemicals and pesticides can poison their internal systems, while discarded rubbish like nets, plastics or fishing lines can strangle the animals to death. Whales are, just like dolphins, highly acoustic mammals. 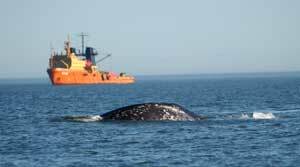 Noise caused by coastal developments and industrial activities can disrupt whales. Tourism also effects whales. They can feel very harassed, especially when they are breeding and calving. When chemicals pollute the oceans, the food of whales also gets polluted. Female whales then pass these pollutants directly on to their young through their milk, which can result in death or disability. These pollutants also cause the lowering of the whale's resistance to disease. This means they are more likely to die from diseases. Commercial as well as scientific whaling by countries as Japan and others remains a huge threat to the survival of certain whale species. Male humpback whales change their songs when human noise is present - Male humpback whales reduce or cease their songs in reaction to human-generated shipping noise, according to a new study. Growing noise in the ocean can cause dolphins to simplify their calls - Noise levels in the world's oceans are on the rise, but little is known about its impact on marine mammals like dolphins that rely on sound for communication. Researchers have found that dolphins are simplifying their calls to be heard over noise from recreational boats and other vessels in nearby shipping lanes. Did mosasaurs hunt like killer whales? - Researchers have examined the youngest-ever specimen of tylosaur ever found. Like orcas, mosasaurs might have used their bony noses to strike prey.